Gabriel Cousens, MD, claims that diabetes is a curable disease that may be reversed through dietary and lifestyle changes. 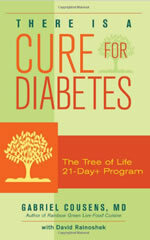 In There is a Cure for Diabetes, Cousens outlines the causes of diabetes as well as a program for eliminating it. The book was inspired by a movie that was based on documenting the effects on diabetes of eating a raw food diet for thirty days. By the fourth day, four of them were off their insulin medications. By the end of the month all of the participants had achieved normalization of their blood sugars without medications. After realizing the powerful effect of this approach, Cousens created a program that could be successfully applied to all diabetics. At the commencement of the program dieters are advised to undertake a seven-day supervised fast on green juices. This greatly accelerates the improvement of the physiological imbalances that occur with diabetes. Following this dieters undertake a low glycemic index diet that includes a very high proportion of raw foods and a fat intake of 15-20%. Many foods are to be avoided including most fruits, dairy products, eggs, fish, meat, refined grains, sugars and natural sweeteners, alcohol and caffeine. The basic diet is to be followed for three to six months. When your physiology has stabilized you can adjust the diet to include a slightly higher intake of fruits and grains, however you can stay with the basic diet if you prefer. Leafy green vegetables are an important component of There is a Cure for Diabetes with 1-2 pounds being the recommended daily intake. Greens can be consumed in salads, blended green soups, green smoothies or as juice. Other foods that are included in the diet include all vegetables with the exception of cooked starchy vegetables, nuts and seeds, avocado, whole grains and legumes. Cousens also conducts a 21-day program at the Tree of Life Center, which is designed to introduce dieters to the program and to learn the skills necessary to maintain it as a lifestyle. Green leafy vegetables, tomato, avocado, cucumber, red pepper, sea vegetables, cabbage, bitter melon, nopal cactus, garlic, onion, huckleberry, goji berries, millet, brown rice, oats, garbanzo beans, pinto beans, string beans, olive oil, almond, walnuts, avocado, flaxseed, chia seeds, coconut oil, bee pollen, spirulina, stevia, carob. Exercise can be a vital component of a program to address diabetes because it improves insulin sensitivity and assists with weight management. Cousens says that the best exercise is jumping on a rebounder for up to 16 minutes a day, four times a week. Walking, jogging and swimming are also acceptable cardiovascular exercises. Muscle building exercise is also recommended because the muscle tissue is responsible for 80% of blood sugar uptake following a meal. Muscle tissue also increases the rate of calorie burning. There is a Cure for Diabetes retails for $19.95. It may also be necessary to invest in kitchen appliances such as a juicer, high-powered blender and food dehydrator. Program has achieved success in allowing diabetics to achieve balanced blood sugar without using medication. Allows diabetics to take responsibility for their condition and to make dramatic improvements in their health. Based on scientific research as well as practical experience. Addresses lifestyle factors involved in diabetes such as physical activity and stress management. Highly restrictive and requires elimination of many foods. May be socially isolating, as it will be extremely difficult to eat acceptable meals away from home. May be difficult to stick to the program without adequate social support. Requires a large amount of time to be spent on food preparation. Many of the recipes are complicated and contain uncommon ingredients. Although it requires a complete diet and lifestyle overhaul, There is a Cure for Diabetes has been proven to be highly effective for the treatment of diabetes. Maintaining adequate support from friends and family is likely to be a vital element in achieving long-term success because the diet is so restrictive and the plan requires a high degree of commitment. I think I’ll stick with the diabetes. After a week or so on that diet, I’d wish I was dead. If this is the cure can you let the FDA know so all the IDDM and NIDDM people can get innoculated? I’m tired of being a diabetic so please let me know when this ‘cure’ comes out on the market. This is so idiotic and irresponsible. Like leading the public to believe that being overweight means you’ll be or are diabetic. I was skinny all my life and all that time I was a diabetic. It wasn’t until my disease got worse and more symptomatic that I became 200lbs. So think first before hawking this crap. I wonder does this work for Type 1 as well or is it just Type 2 Diabetes?